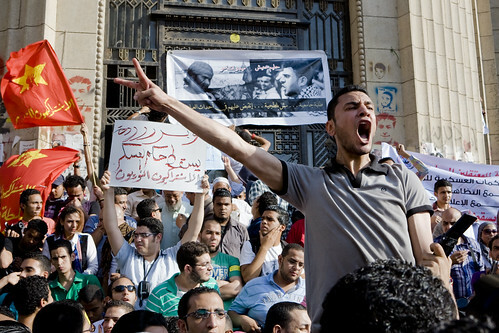 El-Housseini abu-Deif died at a hospital in Cairo after a week-long coma from being shot in the head during clashes. Protesters numbering in the hundreds of thousands took to the streets in Egypt after President Morsi granted himself near-absolute power last month. This week, VOMENA talks with Egyptian journalist Ahmad Shokr about the quickly-evolving political landscape in Egypt, and who the key players are. Also, journalists and activists mourned the death of photojournalist El-Husseini abu-Deif, who died yesterday after being shot in the head during clashes last week. Adel Iskandar, adjunct professor of communications at Georgetown University and author of the forthcoming book, “Egypt in Flux: Essays on an Unfinished Revolution,” weighs in on the current state of independent media in Egypt and Al Jazeera’s new role in the country’s politics. Special Voices of the Middle East broadcast about the historic uprising in Egypt and its implications for the region at large and the world beyond. We’ll be joined by a stellar team of middle East and north African experts, who will analyze and decode for us the meaning and significance of this epic moment in world history.